I'm more active on LinkedIn than on BBM, Facebook, Twitter and any other social media site/tool. And I can't really say it's deliberate, things just turned out that way. As I became more professionally inclined, I ended up checking Facebook once in several days and became very less chatty online. I have so many things competing for my time such that I can't do anything mindlessly. For everything I'm doing there are about 5 other things I could have been doing. And it's so hard to spend time on Facebook scrolling through time wasting posts when I could be spying a possible business partner/client on LinkedIn. Today's post is a result of the request of one of my dearest blog readers and I know he asked that I write on making the most of LinkedIn more for the benefit of my other blog readers who might pick one or two helpful tips. And I hope to get some feedback tips too, via comments or emails. You might want to read my 2011 post on how I got a full-time job and a part-time job via LinkedIn. LinkedIn is the social network for professionals. And I believe whoever is working for pay is a professional. So if you fall under that category you should be on LinkedIn. 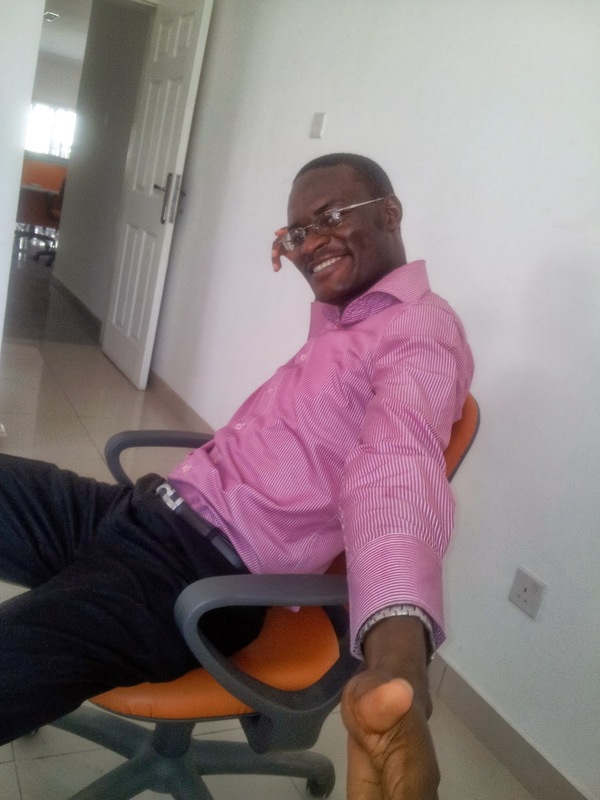 I will also suggest you add me as your connection, my LinkedIn page is http://ng.linkedin.com/in/olafusimichael You should see a profile like the one below. Now that you are on LinkedIn, how do you make the most of out it? A job when I needed one the most. A special meeting with the MD of Pearson Nigeria and founder of Kachifo, publisher of Chimamanda Adichie's popular novels. Recruiters' attention, even when I'm not looking for a job. Business partnership requests from fellow Nigerians and foreigners. Content for my numerous CV versions. 1,303 contacts comprising CEOs, HR managers, senior managers and professionals spread across the world. I occasionally get invited to webinars and get to know about really cool stuff happening in the professional world beyond Nigeria via my foreign contacts. Lastly and recently, a meeting with the MD of VConnect. Use a professional picture. I'll suggest you don't use a funny looking selfie or the kinds of pictures we fill our Facebook albums with. Use a picture that your company can put in the company brochure. Have an all-star profile by filling your profile page. 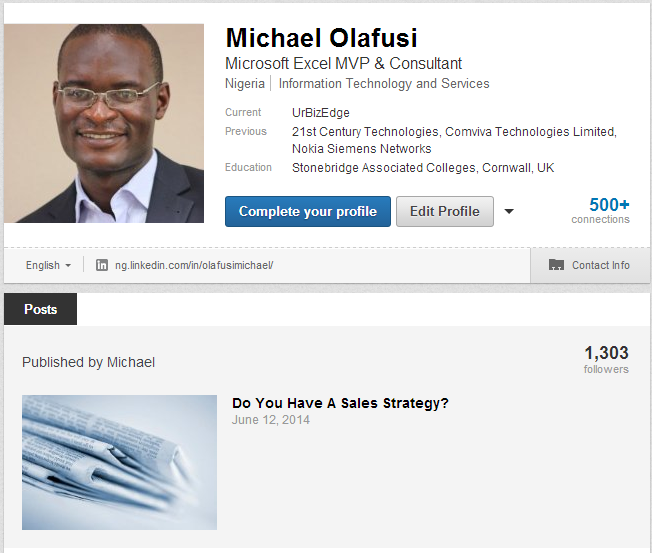 Let your LinkedIn page be more detailed than your CV. Add all your friends, old and new colleagues, and business associates. Then add lots of HR people, they always accept connection requests and share news about job/business opportunities. Join Lagos Business Club, Nigeria Business Network, Africa - All Things Business, and other LinkedIn groups of interest to you. Like your school alumni group, industry group, interest group, e.t.c. Follow companies you would like to work for or do business with. Don't forget to follow UrBizEdge. Be social. Like people's good updates, say congrats to your contact who just got a new job and endorse your friends for skills you know they have. These give you good karma. Don't post stupid pictures (like the solve if you're a genius pics and other pics that are fit for only Facebook). And don't criticize anyone, swallow your beef. Recruiters and biz partners often check your LinkedIn page. They won't be impressed with any teenager like posts you make. Install the LinkedIn phone app. It syncs with your phone contacts and provide more functionality. And the super cool thing about the LinkedIn app is that you can send a connect request to anyone, unlike the website that might ask you for the person's email. Make it a habit to read through your LinkedIn home page and your favourite group's discussion every weekday or every other weekday. Finally, take advantage of the free offers LinkedIn occasionally give. I recently got a $50 advert coupon which I used to promote my company services to big potential clients. I'm trying to take advantage of the free one month premium offer. And that's how I believe you can make the most of LinkedIn.